Peter Whittell, who has died at the age of 78. A former news editor of the Doncaster Free Press who also worked for The Sun, Daily Star and Daily Express and wrote the life story of Doncaster Rovers legend Alick Jeffrey has died. Peter Whittell, who also worked with broadcasting legend Sir Michael Parkinson during his career, died in the early hours of Saturday morning after suffering a fall while visiting relatives in his home town of Doncaster. Peter Whittell (back, second from right) with Doncaster Free Press colleagues in the late 1990s. Mr Whittell, 78, had a long and distinguished career in newspaper journalism and reported on dozens of major stories during 25 years working in Manchester for some of Britain's biggest tabloid newspapers. Born in Scawthorpe, he attended school in Highfields and began his illustrious career as a trainee journalist on the Yorkshire Evening Post and Doncaster Chronicle before becoming a freelance journalist in Barnsley. It was during his early days in Doncaster that he worked alongside Barnsley-born broadcaster Sir Michael Parkinson, long before the latter went on to enjoy a lengthy television career as a renowned broadcaster and chat show host. The pair covered the 1958 Munich Air Disaster when eight Manchester United players were among 22 people who died when their plane crashed on a snow covered German runway on the way back from a European Cup match. Peter Whittell (centre) in the former Doncaster Free Press newsroom on his retirement day. Then a 16-year-old raw recruit, Peter was a friend of the family of Highfields-born Red Devils ace David Pegg - and as news of the disaster filtered through, he was given the unenviable task of breaking details of the tragedy to the player’s mum and dad. He later worked on the staff of the Sheffield Telegraph before making the move over the Pennines to Manchester where he spent the bulk of his career. Starting as a news reporter with The Sun, he later worked as assistant news editor at both the Daily Express and Daily Star and covered a number of major stories during the 70s and 80s including the arrest of the Yorkshire Ripper and risking his life covering The Troubles in Northern Ireland. In the later years of his career, he returned to Doncaster and became news editor of the Doncaster Free Press, living at Scawthorpe with his wife of more than 50 years, Dinah. David Pegg was one of the Busby Babes who died at Munich - and Peter Whittell broke the news of the tragedy to his family. He was a regular at the now closed Adam and Eve pub in Scawthorpe as well as The White Swan and Old George pubs in Doncaster town centre where he struck up friendships with a number of colourful characters. The couple had two children, Sarah, who now runs the Jolly Farmers pub in Leavening, North Yorkshire and Ian who followed his father into journalism, becoming an acclaimed sports journalist and covering basketball and other sports for The Sun for many years. After his retirement in 2001, Peter, a keen walker and swimmer and lifelong Doncaster Rovers fan, kept himself busy and threw himself into writing the life story of club legend Alick Jeffrey. 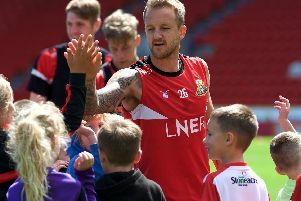 The book, published in 2003, charted the rise of the player generally regarded to be the greatest in Rovers' history and went on to become a best-seller in the team's club shop. In retirement, Peter and Dinah moved to Birdsall in North Yorkshire where he could regularly be found at the bar of the Jolly Farmers pub where he would regale regulars with anecdotes and tales and scrapes from his life in the newsroom. He would also spend hours with his three grandchildren Jamie, Tommy and Hannah and occasionally attended games at Manchester City, a club he had come to love and support while working in the city. Speaking of her uncle, Laura Haughey said Mr Whittell had been to visit his brother Michael in Doncaster to attend a concert celebrating the music of Lindisfarne, one of his favourite bands, but suffered a fall before the show and was unable to attend. She said: "He was left a bit shaken up so decided to stop at home and have a beer in front of the TV with Dinah. At the end of the night he was still feeling unwell and sadly collapsed at the top of the stairs as he was helped to bed. "Although he had become frail in his later years, he hadn't been seriously ill and it was quite sudden. It was very quick and fortunately he didn't suffer." Former colleagues have been quick to pay tribute to Peter. Peter Whittell penned the life story of Doncaster Rovers legend Alick Jeffrey. Current Doncaster Free Press reporter Darren Burke, who began his career under Peter's tutelage in 1992, said: "Peter was an exceptional journalist, very much of the old school and one who taught me so much back in those early days. "As a young trainee, I used to sit and listen in awe and amusement as he recounted the colourful tales from his career - how he'd nipped out to buy a bottle of milk and came back a week later after unexpectedly being told to get himself on a plane to Northern Ireland. "Or the time he'd reviewed the local panto without seeing it because it was on the same night as the office Christmas party which he didn't want to miss, only to find out the next morning that the lead actor who he'd praised so dearly in print on an early deadline had actually fallen off stage mid performance and had to be shipped off to hospital with a broken leg. "He took so many of us under his wing and if you passed the initiation ceremony of a night down the pub, you were accepted into his circle. Always immaculately dressed, he was a true raconteur with a battered contacts book which would always bring in many great exclusives. "Whether mixing with the great and good or a little old dear with a story to tell about a broken window, he could speak to anyone and get them to tell their stories. It's an easy thing to say, but Peter truly was a one-off. A tenacious and dedicated journalist but who also brought fun with him wherever he went, quite often with the cry "Whittell's the name, fun is the game!" Steve Kennedy, Associate Editor at The Sun, started as a junior reporter on the DFP in 1996 when Peter was news editor. He said: "Everything I ever learned about stories - how to get them, how to write them and above all how to revel in the sheer joy of them - I learned from Peter. "He was a brilliant news editor; generous, funny and kind while at the same time keeping you on your toes. "He had an incredible ability to make you want to impress him. And if you impressed him it meant you were doing your job properly. "Without Peter I would never have made it to The Sun. "There are a great many of us who owe him a great deal." Huddersfield Examiner journalist Robert Sutcliffe also worked alongside Peter during his time in Doncaster. He said: "Nearly 30 years ago, I began my journalism career in Doncaster and as a very raw recruit he immediately took me under his wing although I worked for a rival newspaper. "We had the most wonderful times with a glorious cast of characters. My day would start with a welcome knock on my door at 10.30am asking me if I was coming to "Dr Oates's early morning surgery for my medicine?" "This had nothing to do with either of us suffering from any ailments and everything to do with urgent need for refreshment. "Dr Oates's surgery was in fact a fairly racy pub called The Olde Castle which had the inestimable advantage of opening at 10.30am - the only pub in the area allowed to do so in those days. And the name of the landlord was Terry Oates. "As Editor of my paper I had a fair amount of latitude and an excellent deputy, Kevin Smith, so I would invariably say 'yes'. We both had a keen sense of the ridiculous and enjoyed ourselves skewering the many personalities who came under our radar. "In those halcyon days, journalism was very much a fun profession and Peter, a consummate professional, and I certainly had a ball. "We became very good friends and each day would end with a trip to The White Swan which in those days boasted the tallest bar in the country and some wonderful characters including Violent Violet, 'Distemper', a house removal van chap called 'What's On', and a great landlord called Bryn Todd." "Peter's retirement do from the Express which he worked for for many years in Manchester was such a riotous occasion that it is still remembered fondly after more than 30 years. "He admitted to me that he wept when he left as he knew that way of life was over and the drink flowed so freely that his huge cheque had to be reissued the following day after it was found underneath some fag ash and empty beer bottles. "He was far too young to retire and so spent his twilight years at the Doncaster Free Press, a paid-for weekly newspaper, firstly as Chief Reporter and then as News Editor. "Eventually, he decamped from Scawthorpe, a Doncaster suburb, to a tiny village in North Yorkshire where his daughter had taken on The Jolly Farmers pub. "Needless to say Peter was in heaven and I and various friends used to enjoy periodic visits to see him and his lovely wife Dinah in their rural idyll." Former DFP sports editor Peter Catt said: "We only crossed paths in later life when he arrived at the DFP but instantly became mates swapping tales about the old days. "My favourite story of his was when he went on a night out in Manchester with Tommy Docherty, Alex Higgins and George Best among others. "At the end of the evening they were the only four left standing. "Peter said 'I wanted to find somewhere else open to go for another drink but they'd had enough...bloody lightweights'!" Details of Mr Whittell’s funeral will be released by the family in due course.